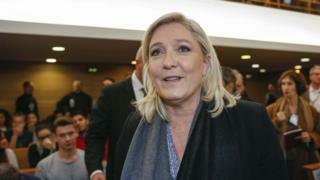 Ms Le Pen's anti-immigration and anti-EU message is attracting increasing support in France and her party is hoping to win two French regions in December local elections. "I'm sorry, but some people are very fond of talking about the Second World War and about the occupation, so let's talk about occupation, because that is what is happening here," she told National Front supporters. "There are no tanks, no soldiers, but it is still an occupation, and it weighs on people." "We're a month away from a regional election and this affair dates back five years," she told reporters. An opinion poll at the weekend suggested her niece, Marion Marechal-Le Pen, could wrest control of the key southern region of Provence-Alpes-Cote d'Azur (Paca) from the governing Socialists. This trial goes right to the heart of the National Front's revamped political campaign. Under Marine Le Pen, the party has tried to "detoxify" its public image and distance itself from accusations of racism and anti-Semitism, but critics say its focus has simply switched to Muslims. Not so, says the party leadership: their target is not Muslims per se, but Muslim extremists; those whose belief and behaviour threatens the "uni-cultural" France that Ms Le Pen envisages. The FN has been treading a careful line between broadening its appeal to a wider section of voters, and voicing what it says are the legitimate concerns of France's "forgotten" working classes, eking out a precarious existence in the face of France's immigration policies and globalised economy. The Lyon trial could deliver a vicious kick to Ms Le Pen's work on cleaning-up her party's image (and also to her own chances in December's regional elections); or it could provide another chance for the party to present itself as victimised by the French political system; pitted against remote, out-of-touch elites. Alarm at the party's rise has prompted President Francois Hollande to warn France not to take the risk of backing the far right. "Don't play with this way of voting just to send a message, just because of unhappiness and anger," he told French radio. "For investors, for external trade, jobs and growth, there will be consequences." The practice of Muslims praying in the streets was banned in Paris in 2011 after a political outcry. Ms Le Pen was investigated for her public remarks but the initial inquiry was closed without action in 2011. An anti-racism group then filed a new complaint, which led to a judicial inquiry being launched in 2012. Ms Le Pen was eventually stripped of her immunity from prosecution by the European Parliament in 2013. She is accused of incitement to discrimination, violence or hatred towards a group of people because of their religious affiliation and if found guilty could face up to a year in jail and a fine of €45,000 (£33,000; $51,000). The French Council of the Muslim Faith said her remarks had fed a climate of Islamophobia.